We aim to create a Downstream portfolio that is more focused on larger, integrated refining and petrochemical sites that are better able to respond to growth opportunities and tighter fuel specifications. A key part of our strategy is to divest non-core assets while selectively investing in high-growth markets. We have retained our larger and more integrated refineries, and our current portfolio is positioned for optimisation across the value chain. We have interests in 22 refineries worldwide. They have the capacity to process a total of around 2.9 million barrels of crude oil per day (Shell share) into a wide range of products, including gasoline, diesel, heating oil, aviation fuel, marine fuel, lubricants, liquefied petroleum gas (LPG), sulphur and bitumen. Approximately 35% of our refining capacity is in Europe and Africa, with 42% in the Americas and 23% in Asia and Oceania. Efficiency improvements have contributed to a reduction in greenhouse gas emissions from our refineries and petrochemicals plants. Achieving even greater efficiency and operational reliability will also help us improve profitability. The average availability of our refineries, a measure of their operational performance, was 90% in 2016. In Canada, we completed a debottlenecking project at Scotford refinery, which will increase its hydrocracking capacity by about 20%. In the Netherlands, we began construction of a major unit at the Pernis refinery. The new solvent deasphalter unit will remove heavier fractions from crude oil, allowing the refinery to upgrade a larger proportion of its oil intake into lighter, high-grade products. Completion is expected by the end of 2018. In September 2016, we reached an agreement with Dansk Olieselskab ApS for the sale of A/S Dansk Shell in Denmark, which includes the Fredericia refinery. In December 2016, we completed the sale of our 51% shareholding in SRC in Malaysia, which includes the Port Dickson Refinery, to Malaysia Hengyuan International Ltd. In 2017, Shell signed binding definitive agreements with SRI for the separation of assets, liabilities and businesses of Motiva. Following completion of this transaction Shell will assume sole ownership of the Norco and Convent refineries in Louisiana, 11 distribution terminals and Shell-branded markets in various regions of the USA. SRI will assume full ownership of the Motiva Enterprises LLC name and legal entity, including the refinery at Port Arthur, Texas and 24 distribution terminals. Motiva will have the right to exclusively sell Shell-branded gasoline and diesel in other regions in the USA. Shell Trading and Supply is one of the largest energy trading operations in the world. This global organisation combines our network of trading companies, industry-leading shipping and maritime capabilities and an integrated network of supply and distribution activities, to act as the central nervous system for Royal Dutch Shell. Our trading capability, deep market knowledge, global portfolio and end-to-end integration within Shell effectively creates opportunities to deliver value for our customers and for Shell across our Upstream, Downstream and Integrated Gas businesses. Through our main trading offices in London, Houston, Singapore, Dubai and Rotterdam we trade crude oil, natural gas, LNG, electricity, refined products, chemical feedstocks and environmental products. We have the experience and international scope to capitalise on trading opportunities inherent in Shell’s asset and market positions around the world to deliver sustained and growing cash returns. 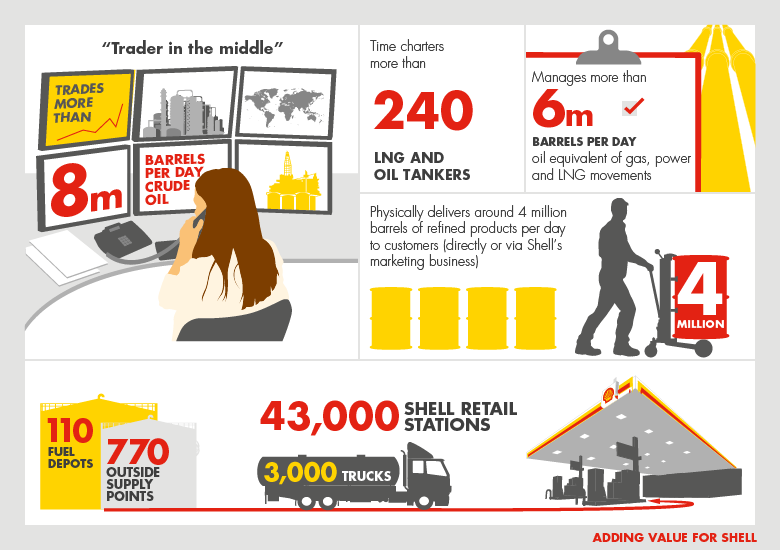 In 2016, Shell integrated all gas and energy marketing and trading capabilities under Trading & Supply, creating Gas and Energy Marketing and Trading. This is the market interface for our Integrated Gas business, managing the flow of gas molecules around the world to meet customer demand for reliable and flexible energy supply. With more than 100 distribution terminals and 770 supply points in around 25 countries, our supply and distribution infrastructure is well positioned to make deliveries around the world. This includes supplying feedstocks for our refineries and chemical plants and finished products such as gasoline, diesel and aviation fuel to our Marketing businesses and customers. Our Shell Shipping and Maritime business has a high level of expertise and decades of experience. It is responsible for ensuring that all of our global maritime activities are safely managed, including a fleet of around 40 LNG carriers and 10 oil tankers. In addition, we have more than 240 oil and LNG vessels on time charter. There are around 2,000 vessels associated with Shell on the water on any given day, including the ships, barges, drilling rigs, supply boats, FPSOs, FSRUs, SBMs and the related operations that take place in ports and terminals. Read a textual description of the above chart.